Samsung, no doubt, has made sure that there shouldn’t be any sort of leaks for the alleged Galaxy S5. Months before Galaxy S4 was released, we even saw a hands on review on the device along with pictures and video to show it’s not fake. Although countless rumors have been circulating around the web for months regarding what specs the upcoming device will have, we still haven’t got the chance to actually see a leak of the handset itself. For now, all we know is that there will be two variants of the Galaxy S5, one standard and the other premium. 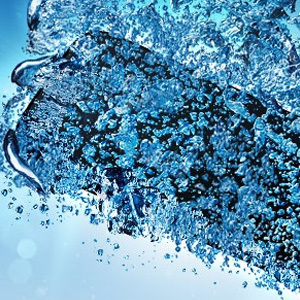 O2 Germany posted a teaser page of the upcoming smartphone in water which clearly indicates it would be a water resistant device, just like Sony’s Xperia. 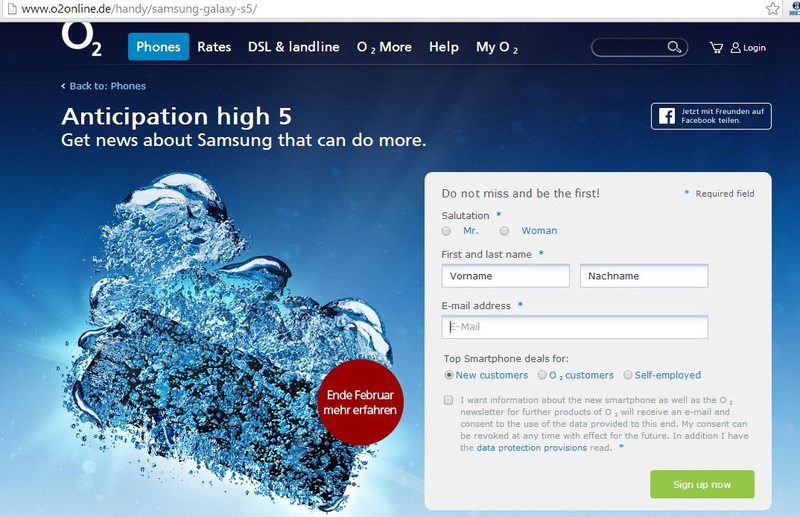 The page doesn’t give out any information stating its the Galaxy S5, but the URL surely does. It’s really hard to tell how the Galaxy S5 will look like from the pictures. There’s a pre-registration page for the interested users who would want to know about the launch of the smartphone and it too mentions the date to be the end of February, which by now we already know as Samsung’s MWC press event. The premium version will be armed with a 2.5GHz Quad-core Qualcomm Snapdragon 800 (MSM8974AC) SoC, Adreno 330 GPU, 3GB RAM, 32GB of internal storage, QHD (2560×1400) resolution display, 16-megapixel main camera sensor, 2.1-megapixel front facing camera. Whereas the standard version will house a Octa-core Samsung Exynos 5422 SoC with a clock speed of 1.5GHz, ARM Mali-T628 GPU, 2GB RAM, 16GB of internal storage, Full HD (1920×1080) resolution display, 16-megapixel main camera sensor, 2.1-megapixel front facing camera. Mark your calendars Samsung fans! Something big is surely coming! Samsung Galaxy S5 gets teased by O2 Germany!